Anyone who has struggled with toenail fungus, an unsightly and difficult to treat condition, understands the enthusiasm being generated by word of a new miracle cure. Laser treatment for toenail fungus is making its way onto the market in limited venues and desperate consumers who can afford to take the risk are beginning to try it out. But are laser treatments for toenail fungus the miracle cure everyone has been looking for or simply an expensive procedure that offers less than exceptional results? The millions of people who suffer from fungal nail infections are mostly adults. The infection occurs as a result of a rapid overgrowth of fungi that feeds off of dead skin and nail tissue. Many microorganisms, such as fungi and bacteria, normally live on the body unnoticed. They can even be beneficial. Given the right conditions, however, they can also grow out of control and cause an infection to develop. 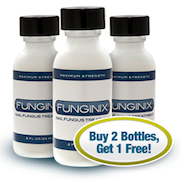 Fungi thrive in moist conditions making toenails a prime target for a fungal nail infection. People who use public swimming pools and gyms or who perspire heavily are more likely to develop fungus infections of all types. Although it can occur on fingernails, it usually affects toenails. Feet enclosed in shoes and socks that hold heat and moisture in create conditions conducive to infection. 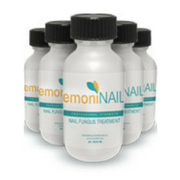 Nails that are infected with toenail fungus become brittle and thicken. They are often discolored and misshapen and may crumble. A doctor can easily diagnose the condition simply by appearance. Treatment, however, is not quite so easy. Although toenail fungus does not generally cause any significant health problems, except in individuals with diabetes or immune disorders, it is an unpleasant aesthetic condition, like baldness or cellulite. People who suffer with it are eager to find a cure that works. Thus far, podiatrists and other physicians responsible for treatment options have little to offer. Before laser treatment for toenail fungus appeared, other methods have been used with less than stellar results. A variety of creams and ointments are available for purchase over the counter but most of them seem to have insignificant benefits. Prescription medicines taken orally have only slightly better results but also have significant side effects and a slight risk of liver damage. Fifty percent of the people who are able to tolerate these medications do see results but the infection can reoccur. A prescription lacquer is also available but even with long-term use only ten percent of users see any benefits. There are many natural cures that include everyday items such as chlorine bleach, Listerine mouthwash, Vicks Vaporub as well as Tea Tree oil, Lavender oil and Oregano oil. None offer an effective cure. Laser treatment for toenail fungus is the newest treatment method to appear. As laser treatments for all types of illnesses and conditions grow in popularity, it is natural that it be considered to treat toenail fungus. The first laser treatments were tried in the 1980s. They were designed to create small holes in the nail bed in an attempt to get medications closer to the source of the problem. These treatments were both costly and virtually ineffective. 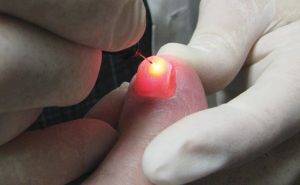 Today the laser treatment makes a comeback in the toenail fungus treatment arena because the market is ripe for a cure. Any device manufacturer who is able to get an effective product on the market stands to gain significantly both in notoriety and financially. As a result, companies who are manufacturing laser equipment to treat toenail fungus are rushing their products to market, even in advance of FDA approval. Only limited testing has been done and with uncertain results. Podiatrists also stand to gain should laser toenail fungus removal treatments prove effective. Many are jumping on the band wagon and offering these treatments even without FDA approval. They don’t make any promises and those who can afford to take the gamble do so believing it is worth the risk. A cure may or may not occur but the only side affect is a leaner bank account. The initial treatment costs the patient $1,000 to $1,500, with follow-up treatments of approximately $500. When you know that laser treatments for toenail fungus are not covered by insurance, you understand that it’s very serious money for patients! While the jury is still out on the efficacy of laser treatments for toenail fungus, podiatrists are drawn in by the idea of a miracle cure for toenail fungus. They are eager to have something at last to offer their patients, and it doesn’t hurt them a bit. In fact, they stand to gain quite a bit financially. An important question remains unanswered for the consumer. Is the laser treatment for toenail fungus, in fact, a miracle cure or just premature hype by the medical community and the manufacturers of the laser equipment for a cure that has not yet been proven?